TAKE ADVANTAGE OF THIS LOW INTRODUCTORY PRICE! Heavyweight disposable tableware that will impress your guests. People won't believe it's plastic! Elegance and sophistication combined with great quality and the BEST price. We have listings for most possible combinations with plates, cutlery and cups. When you navigate through the categories and subcategories on the left hand side, you will easily find the listing to match your needs. This Listing Includes (per guest). X 10.5'' Heavyweight Plastic Dinner Plates (White with Silver rim). X 7.5'' Heavyweight Plastic Salad/appetizer Plates (White with Silver rim). X Plastic Silver Forks length 7. X Plastic Silver Knives length 7. X Plastic Silver Spoons length 6. X 10oz Heavyweight Clear Plastic Tumbler, with silver coated rim. Choose this option if you DO NOT want napkins included in your order. Adds 1 x White, 3 ply Textured Paper napkin per guest. (1/8 fold, Dinner Size 15 3/4'' x 15 3/4''). Adds 1 x White Paper Luxury " Linen Like" napkin. 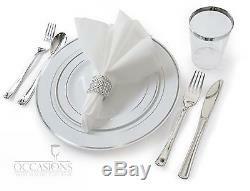 (Dinner Size 15 3/4'' x 15 3/4'') and 1 x Silver color imitation Rhinestone napkin ring per guest. For option C, napkins come in one bag and napkin rings come separate, you need to put them together when you set the table. If you place an order for 240 guests, with "option B"for the napkins. 240pcs - 10.5'' Heavyweight Plastic Dinner Plates (White with Silver rim). 240pcs - 7.5'' Heavyweight Plastic Salad Plates (White with Silver rim). 480pcs- Plastic Silver Forks length 7. 240pcs - Plastic Silver Knives length 7. 240pcs - Plastic Silver Spoons length 6. 240pcs- Heavyweight Clear Plastic Tumblers, with silver coated rim. 3 ply White Textured Paper napkin. If you place an order for 120 guests, with "option C"for the napkins you would get. 120pcs - 10.5'' Heavyweight Plastic Dinner Plates (White with Silver rim). 120pcs - 7.5'' Heavyweight Plastic Salad Plates (White with Silver rim). 240pcs- Plastic Silver Forks length 7. 120pcs - Plastic Silver Knives length 7. 120pcs - Plastic Silver Spoons length 6. 120pcs- Heavyweight Clear Plastic Tumbler, with silver coated rim. 120pcs- White Dinner Linen Like napkins. 120 pcs - Rhinestone napkins rings. Please always make sure the size of plates you are ordering is right for what you need. Depending on the meal you are serving or the occasion, you may want bigger or smaller plates. Below is a list of the plate sizes we carry and some TIPS that will help you determine which size of plate you need. 10.5'' Main Course dinner plate. Usually used for formal dinners, weddings, etc. Slightly smaller than the 10.5'', this plate is very practical for buffet style events, informal or lighter meals. Or if you are on a tight budget, you can use this as a main course dinner plate on a wedding as well. 7.5'' Salad or Dessert Plate. This plate is generally used as a salad plate. Some people prefer bigger plates for salad or first course. I think this plate size is ok for an appetizer, such as a piece of fish, but in my personal opinion, it's not big enough for a big green salad, in that case you will be better off using the 9'' for salad, it really depends on the kind of appetizer you are serving. When used for dessert, the 7.5'' it's big enough for every occasion. 6'' Dessert or Bread Plate. This is a small plate that can be used as a "bread plate" for weddings or formal events, or for a small dessert such as a piece of cake or some fruit. Great for Soups, even for salads (individual portions). Great size for dips too. The item "Wedding Disposable Plastic Plates, silverware, silver rimmed tumblers + Napkins" is in sale since Wednesday, July 8, 2015. This item is in the category "Home & Garden\Greeting Cards & Party Supply\Party Supplies\Party Tableware & Serveware". The seller is "occasionsbh" and is located in Miami, Florida. This item can be shipped to United States.